Warp Pipe Dreams is a Duel Minigame in Mario Party 7. Its name is a portmanteau of Warp Pipe and "pipe dream", a fanciful yet unrealistic hope for things to come. The camera shows the Warp Pipe goal platform out of the maze, and then switches to the players view. 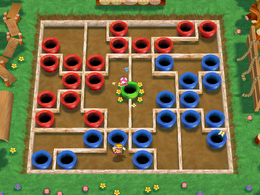 In this minigame, both players are in separated mazes made of Warp Pipes (Player 1's are colored red, Player 2's are blue), and each player has to escape the maze by going through warp pipes, and eventually finding the right one to get into the center area, which both players can access. There is a larger Warp Pipe that gets the player out of the maze. The first player out of the maze wins. Rules – "Head for the goal by jumping in and out of Warp Pipes." Advice – "Remember the pipes that you use so you don't double back on yourself." This page was last edited on August 5, 2017, at 13:54.